Leon Max Lederman was born on July 15, 1922, in New York to Russian Jewish immigrant parents. Lederman grew up in the Bronx, received his bachelor's degree from the City College of New York in 1943, and received a Ph.D. from Columbia University in 1951. Lederman joined the U.S. Army Signal Corps between college and graduate school, where he achieved the rank of Second Lieutenant. After obtaining his doctorate, Lederman remained at Columbia conducting research and teaching for the next 28 years. In 1958, he was promoted to Professor. He became Director of the Nevis Labs in 1961 and held this position until 1978. In 1979, he became Director of the Fermi National Accelerator Laboratory. He was awarded the Nobel Prize in Physics in 1988, along with Melvin Schwartz and Jack Steinberger, for their work on neutrinos. 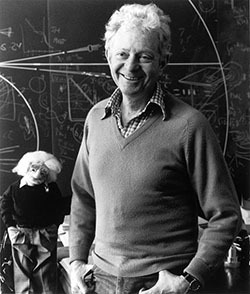 In addition to receiving the Nobel Prize, Lederman was awarded the National Medal of Science (1965) and the Wolf Prize for Physics (1982). He is Director Emeritus of Fermi National Accelerator Laboratory (Fermilab) in Batavia, Illinois. He founded the Illinois Mathematics and Science Academy, in Aurora, Illinois, in 1986. His current occupation is a resident scholar in the Illinois Mathematics and Science Academy. The work now rewarded was carried out in the 1960s. It led to discoveries that opened entirely new opportunities for research into the innermost structure and dynamics of matter. Two great obstacles to further progress in research into weak forces - one of nature's four basic forces - were removed by the prizewinning work. One of the obstacles was that there was previously no method for the experimental study of weak forces at high energies. The other was theoretically more fundamental, and was overcome by the three researchers' discovery that there are at least two kinds of neutrino. One belongs with the electron, the other with the muon. The muon is a relatively heavy, charged elementary particle which was discovered in cosmic radiation during the 1930s. The view, now accepted, of the paired grouping of elementary particles has its roots in the prizewinner's discovery. Neutrinos are almost ghostlike constituents of matter. They can pass unaffected through any wall, in fact all matter is transparent to them. During the conversion of atomic nuclei at the centre of the sun, enormous quantities of neutrinos (which belong to the electron family) are produced. They pass through the whole sun virtually unhindered and stream continually from its surface in all directions. Every human being is penetrated by sun neutrinos at a rate of several billion per square centimetre per second, day and night, without leaving any noticeable trace. Neutrinos are inoffensive. They have no electrical charge and they travel at the speed of light, or nearly. Whether they are weightless or have a finite but small mass is one of today's unsolved problems. The contribution now awarded consisted among other things of transforming the ghostly neutrino into an active tool of research. As well as in cosmic radiation, neutrinos, which belong to the moon family, can be produced in a multistep process in particle accelerators, and this is what the prizewinners utilized. Suitable accelerators exist in some few laboratories throughout the world. Since all matter is transparent to neutrinos, it is difficult to measure their action. Neutrinos are, however, not wholly inactive. In very rare cases a neutrino can score a random direct hit or, more correctly, a near-miss, on a quark, a pointlike particle within a nucleon (proton or neutron) in the nucleus of an atom or on a similarly infinitesimal electron in the outer shell of an atom. The rarity of such direct hits implies that a single neutrino of moderate energy would be able to pass unhindered through a wall of lead of a thickness measured in light-years. In neutrino experiments the rarity of the reactions is compensated for by the intensity of the neutrino beam. Even in the first experiment, the number of neutrinos was counted in hundreds of billions. The probability of a hit also increases with the energy of the neutrinos. The method of the prizewinners makes it possible to achieve very high energies, limited only by the performance of the proton accelerator. Neutrino beams can reveal the hard inner parts of a proton in a way not dissimilar to that in which X-rays reveal a person's skeleton. When the neutrino beam method was invented by the Columbia team at the beginning of the 1960s the quark concept was still unknown, and the method has only later become important in quark research. Also of later date is the experimental discovery of an entirely new way for a neutrino to interact with an electron or a quark in which it retains its own identity after impact. The classical way of reacting implied that the neutrino was converted into an electrically charged lepton (electron or muon), and this was the reaction utilised by the prizewinners. The discovery of the Higgs Boson, or “god particle” in 2012 changed the world of physics and confirmed the accuracy of the “standard model” of atom composition. Lederman coined the term “god particle” in reference to the Higgs Boson in a 1993 book titled “The God Particle,” 19 years before the particle was discovered. Lederman wished to name the Higgs Boson the “goddamn particle” due to the particle's “villainous nature and the expense it is causing,” but the book's publisher would not allow it. Suffering from dementia and mounting medical expenses, in 2015 at 93 years of age, Lederman accepted an offer from an online auction company to sell his Nobel Prize. At auction, the medal was purchased for $765,000. Lederman died at age 96 on October 3, 2018.